Any given television season brings more flops than hits. The worst shows – at least, programs with the lowest ratings or the most production problems – are often yanked within weeks of their debuts. "I'm Dickens, He's Fenster," a comedy about a couple of carpenters, was considered a flop, but managed to hang on the entire 1962-63 season, presenting 32 episodes. The stars were John Astin and Marty Ingels, and both were on the other end of the phone for an interview in late December of '62. 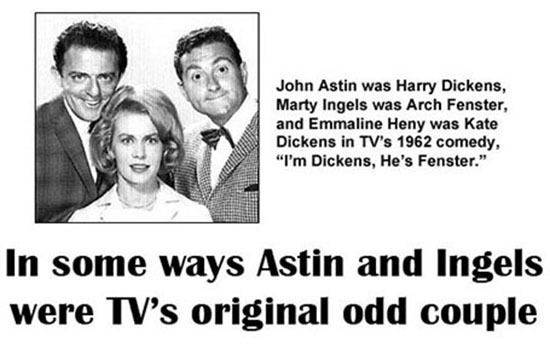 They admitted the ABC show was in trouble, ratings-wise, but Astin claimed the critics liked it. While finding both men funny (especially Astin, who didn't try as hard), the show wasn't on my to-watch list. Its competition included "Route 66," one of my favorites. Astin and Ingels also admitted they didn't care for each other at first. While Astin certainly could be goofy, he was trained as an actor and believed the jokes should rise out of a good script. Ingels considered himself a compulsive comic, one who enjoyed slapstick and thought a plot was merely a thin line connecting a series of jokes. Not surprisingly, Ingels performed his part of the interview, while Astin talked seriously about his career and the series. "YOU CAN tell what kind of people we are by the fan mail we receive," said Ingels. "John gets letters from high school and college students ... typewritten. My letters are written in crayon. "I had a lot of jobs before I went into show business and I was fired from every one of them. I made people laugh but I never got any work done." Ingels said his first break in show business happened while he was in the Army at Fort Dix, N.J. On a brief leave in New York City, he got in line to watch the TV quiz show, "Name That Tune." A "people spotter" for the show liked the looks of the redheaded Private Ingels, pulled him out of the line, enjoyed the soldier's attitude and his gravelly voice, and asked him to be a contestant. Ingels said he clowned his way to a cash prize of $6,000 and decided he would become a comedian. But stand-up didn't suit him – "My jokes were too clean" – so he went to Hollywood in hopes of working in television or films. Those hopes were about dashed, but just as it appeared he would have to go back home to Brooklyn and consider a new career, he did something desperate. "ON WHAT was to be my last day in California I tried to get into Paramount Studios, but the guard turned me away. So I went across the street to a restaurant and ordered 12 coffees to go. I paid a waiter to wear his apron and walked back across the street and into the studio carrying the coffees on a tray." Safely inside, he got rid of the coffee and went looking for Jerry Lewis' office. He talked Lewis' secretary into buzzing her boss, who agreed to meet Ingels. The result was a small part in "Ladies Man," a Lewis film that was released in 1961. ASTIN'S APPROACH was much different. He became interest in acting while attending Washington and Jefferson College, then changed his major from mathematics to acting when he transferred to Johns Hopkins University. He claimed he earned spending money at Hopkins by tutoring students in analytic geometry and differential calculus. He did graduate work at the University of Minnesota and had leading roles in school productions of "Harvey" and "Ah! Wilderness." He went to Broadway, had a small role in "Tall Story," and later worked with Tony Randall in a Detroit production of "Goodbye Again." It was Randall who convinced him to try movies. Astin made his screen debut as Gladhand, the social director in "West Side Story." He followed that with a scene-stealing performance as the leery-eyed rascal who chased Doris Day in "That Touch of Mink" until she was rescued by Cary Grant. DURING the interview Astin made a statement that now seems hopelessly out of touch with the way audiences have always viewed him. His television show, he said, had changed his career. "Now I'm sore of a leading man. Before I was classified as the kooky character type." 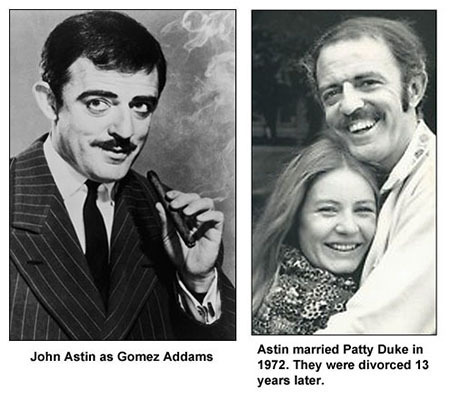 Two years later he was cast as Gomez in "The Addams Family." Leading man, indeed. 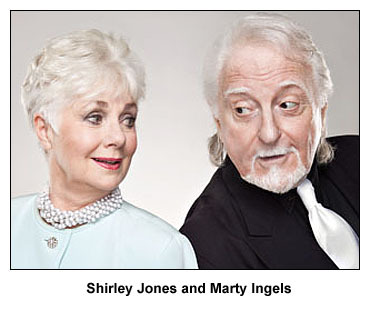 Ingels went from one unusual pairing to another when, in 1977, he married singer-actress Shirley Jones. However, this match proved very successful. They were still married 38 years later when Ingels passed away,, October 21, 2015, at the age of 79.